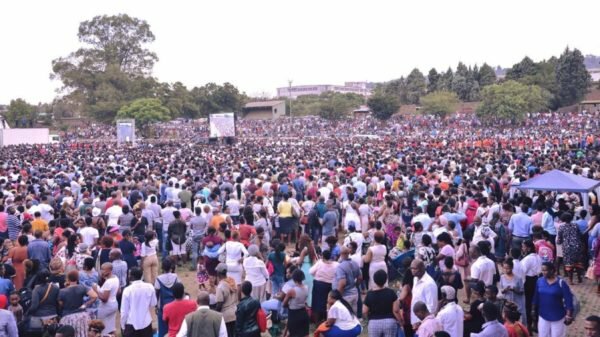 South Africa-based Malawian prophet Shepherd Bushiri of the Enlightened Christian Gathering (ECG) has, once again, pulled another giant surprise with his 2018 Grand Entrance Service on Sunday pulling over 70 000 people and, again, over 20 000 giving their life to Jesus Christ. This was the first service in 2018 for the Enlightened Christian Gathering (ECG) church. The success of the Grand Entrance Service—which rides on the historical FNB turnout two weeks ago during the Crossover Night—represents yet another milestone for ECG and Prophet Bushiri, a herald of even more greater things to come in 2018. It is reported that as early as 5 hours (CAT), thousands had already filled the pews in all the seven halls. The open air space was, again, packed as the clock ticked 8 hours. As Prophet Bushiri arrived around 13 hours, Pretoria Showgrounds was already a sea of saints—drawn from different parts across the world, who had come to praise and worship God at ECG. Over 20 000, according ECG communications director Ephraim Nyondo, gave their life to Christ for the first time. He added that the Prophet even took time to pray and put his hand on almost everybody who came to church with different ailments. In his sermon, Prophet Bushiri called on church leaders across the world to use the pulpit of God to spread the gospel not fights. With the success of the Grand Entrance Service, Prophet Bushiri—who in the build up to the service had been a center of attacks from other ministries and also some governments—has just scored yet another important step in the growth of his ministry.